Netflix recently unveiled several experimental projects that were created during one of its “Hack Days,” where employees can tinker and dream up new versions of the popular streaming service. One of the coolest projects is called Oculix, and it combines the Oculus Rift virtual reality headset with the Netflix experience. Instead of using a mouse to scroll through titles, the Oculus Rift’s head tracking allows users to browse its library by simply gazing around at a virtual sphere of floating titles. 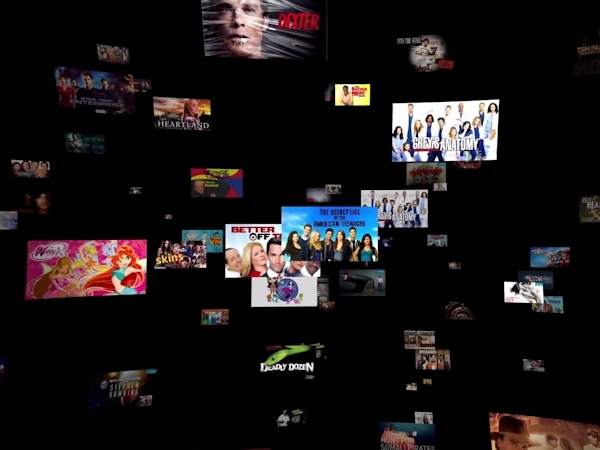 Another layout makes it appear as if you’re staring at a curved wall of movies and television shows, and even uses a Leap Motion Controller for navigating. Once a movie has been selected, the library fades away revealing a virtual movie theater for watching Netflix, allowing users to tilt their head and gaze around the virtual cinema. While it’s great to see Netflix experimenting with the Oculus Rift, the company has said that “most or all of these projects are just fun and will never actually be a part of Netflix,” according to The Verge. No release date has been set for the consumer edition of the Oculus Rift headset, though Oculus has begun shipping out a second version of its development kits to help developers build Rift-compatible titles in time for the consumer edition’s release. You can check out the full Oculix demo [(a 0:38 minute video) here].